The astonishingly prolific Rainer Werner Fassbinder (1945-1982) directed over 40 movies in 15 years. Yet one of his most sprawling works has remained unreleased in the U.S. until now: the epic 1972 working-class miniseries, EIGHT HOURS DON’T MAKE A DAY. It stars many of his favored actors: Hanna Schygulla (THE MARRIAGE OF MARIA BRAUN), Gottfried John (BERLIN ALEXANDERPLATZ), Irm Hermann (THE MERCHANT OF FOUR SEASONS), Kurt Raab (WHY DOES HERR R. RUN AMOK?). It’s a family drama in which the rights of both workers and wives are up for grabs. The vagaries of postwar German capitalism and the changing relationships among men, women, and children fuel the mix through weddings, birthdays, family dinners, workers’ meetings, and romantic trysts. 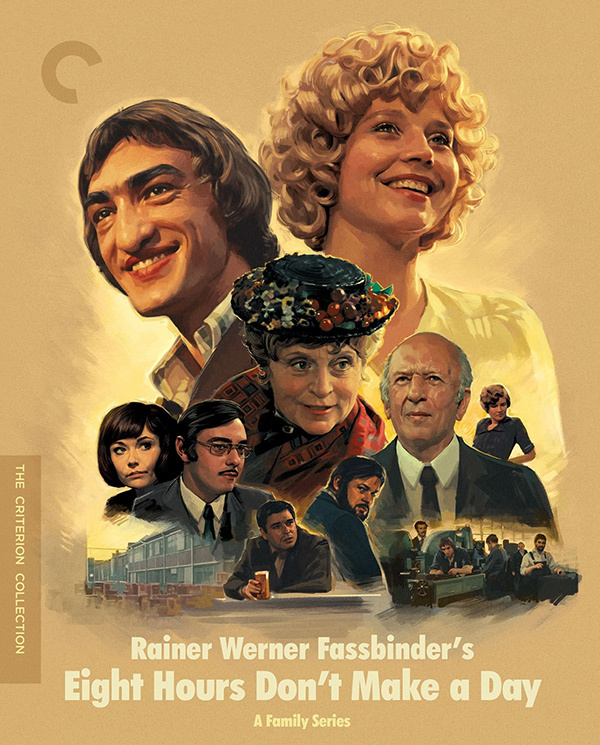 Fassbinder’s people find themselves strangers in a strange new world -- a prescient insight into 21st century anomie. Special price: $33 plus tax and handling.